Dorrance Dance. Photo by Stephanie Berger. New York City Center, New York, NY. Dance fans in New York City clamoured for tickets to the 14th annual Fall For Dance Festival 2017, sending its website into meltdown. At an affordable price of $15 a ticket with a well curated program featuring the best dance companies from the USA and beyond, it’s easy to see why this New York City dance event continues to grow in popularity. This year, dance fans had the opportunity of seeing the renowned Alvin Ailey American Dance Theater, American Ballet Theatre and Stephen Petronio Company alongside companies making their Fall for Dance debut, including Ballet BC, Cie Art Move Concept and IceCraft Dance Company. With a strong representation of ballet and modern dance, the program also offered variety this year, including tap, tango and hip hop dance styles. Miami City Ballet. Photo by Stephanie Berger. For dance lovers, what’s more enjoyable than watching dance? It’s getting the opportunity to get up and dance. Pre-show dance lessons were offered for select performances taught by dance company members. Advanced dancers could sign up for a tap master class with Dorrance Dance or a ballet class with Wendy Whelan or both! The tap master class taught by company dancer Leonardo Sandoval was an hour-and-a-half of rhythmical combinations and patterns, challenging students to master the tap steps, timing and musicality. Sandoval’s friendly approach saw him slowly break down the steps and timing of each combination, giving all students the opportunity to grasp the technicality and timing of each beat. Repeating the combinations several times also allowed the class to build confidence and increase their tempo. Despite tapping on a tarkett floor, it was a thrill for all attending the class to be in the New York City Center rehearsal studios learning from a talented tap dancer who is a member of Dorrance Dance, one of the hottest dance companies right now. Vincent Mantsoe. Photo by Stephanie Berger. With 30 minutes between the class and the start of the show, students quickly joined the audience to enjoy an amazing night of dance. Miami City Ballet gave a superb performance of Christopher Wheeldon’s work, Polyphonia. Set to a beautiful piano score by György Ligeti, the four couples on stage created crisp, clean shapes, executing cannons and motifs to precisely follow the melody and trills in the score, visually bringing the music to life. This elegant piece included partner work, trios and solos, with contortions and beautiful lifts showcasing the technical ability of the dancers. 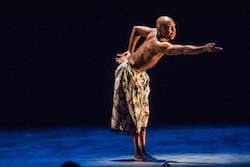 Vincent Mantsoe premiered his work, Gula, in New York, a solo piece that he choreographed and performed. With whistle and bird call sounds, Mantsoe cleverly embodied the character of a bird in all his intricacies of movement depicting a man turning into a bird and a bird turning into a man, which fascinated the audience. Trisha Brown Dance Company. Photo by Stephanie Berger. Trisha Brown Dance Company performed You Can See Us, a collaboration with Bill T. Jones in memory of Trisha Brown, who passed away earlier this year. This work is a revitalized concept of her original 1994 solo, If You Couldn’t See Me. 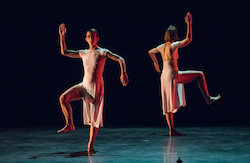 The two female dancers on stage performed continuous sweeping movements that mirrored each other in this unique post-modernism piece. Highly anticipated was the final performance of the night, Myelination, a new expanded work from Dorrance Dance making its world premiere. 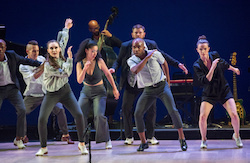 It is not hard to see why Michelle Dorrance was awarded the MacArthur Fellowship in 2015, and more recently the Ford Foundation Fellowship in 2017, as choreographically this new work wonderfully showcases the strength, agility and musicality of tap dancing alongside two featured hip hop/break dancers. 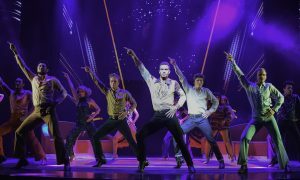 With original music by Prawn Til Dante, Donovan Dorrance, Gregory Richardson and vocals by Aaron Marcellus, this piece is performed by a supremely talented ensemble of nine tap dancers mastering complex and energetic rhythms in an effortless way. Creating shapes with their movement and filling the stage with the musicality of highly technical percussive beats, the boundaries between the tap dancers and the live band could easily blur as they worked harmoniously together. On stage, Michelle gave a dynamic performance with focus and intensity propelling the musicality of her hard hitting beats and precision timing. Nicholas Van Young’s solo demonstrated that he’s a master of rhythm with flawless beats rolling off his feet, while Warren Craft brought his quirky style into his solo of smooth and slippery sliding. Each member of the company, along with the two hip hop dancers, worked cohesively, delivering a superb performance that was met with a standing ovation and strong appreciation from the audience, concluding a fantastic evening of dance.